Every year I come up with an off-season training plan and goals. I posted last years plan here: 2013/2014 Off-Season Training. Being in New England it’s tough to get out there and bike/run much. I like off-season training to give my body a bit of a rest and to focus on doing different exercises. Last winter I spent a lot of time on the bike trainer as well as plenty of time on the treadmill. I was fortunate enough to do a lot of outside miles as well on the weekend’s with someone else. This winter I plan to continue my long runs on weekends as much as possible. I am hoping my long distance fitness will give me that strong endurance to help me for my early season Ironman Texas in May. I also think this long distance running will set me up to train hard next winter as I hope to be running Boston in 2016. Last season I had the intention of lifting more. I started out okay but I was very inconsistent. My lifting didn’t become consistent until about August. My off-season started on November 3rd this year. My last planned ‘A’ race was on October 26th with the Loco marathon. Since I didn’t qualify for Boston and I plan to run the Dallas Marathon in the Middle of December. This won’t change my off-season training except to push back any bike trainer workouts that I had planned on weekends. My main focus this off-season is to lift, improve my nutrition, and lower my body fat. I don’t want to reveal to many of my plans around this but I am calling it ‘Rocky’ training. I may reveal more details on this sometime in either February or March. My weight now is about 168 pounds and my body fat is hovering around 16%. I have every intention of lowering my body fat as much as I can by May. I believe I know how to do this and if/when it works I will be writing a few thousand words on it. I am expecting this to be life changing. I want to continue to spend a few hours a week on the trainer. During the season most triathletes are training about 8-15+ hours a week. In the off-season I tend to be about 6-8 hours depending on other priorities. This breaks down to about 2-3 hours on the bike, 2-3 hours running, 1-2 hours swimming, and about 1-2 hours of lifting. This winter I will be changing this up a bit. The 2-3 hours of biking is accurate. The rest of the changes are a bit private but enough to get in all of the work I need to for May. I do need to get in the pool a bit more this off-season. I tend to start back up after the first of the year. I am considering switching gyms where the pool schedule is a bit friendlier and is a bit closer to me as well. Ideally I would be in the pool three times a week but I would okay with two days a week until spring. After a strong race in Ironman Chattanooga in September I fully expect 2015 to be the turning point in my triathlon racing. I do think the turning point started at Timberman in August and has continued. I am now ready to take that next step. As a triathlete I was hovering around the bottom 20% but with Timberman and Chattanooga I was able to improve to 50%. As a runner I am normally in the top 5%. So I would hope in the next 18-24 months that I can improve in triathlon to be in the top 25-30%. I came into this marathon with the hopes of qualifying for Boston. I needed to run a 3:15 which I thought was possible. I also knew I wasn’t sure how my body would respond after about 18-20 miles. I ended up with a 3:30 marathon time but as you will see below my time was really closer to 3:20. I came into this marathon with a lot of racing miles under my belt since mid August. This was my fifth ‘A’ race in the last ten weeks. Which included Timberman; a 1/2 Ironman (8/17), a 20K running race (9/1), Reach The Beach (9/12-9/13), and Ironman Chattanooga (9/28). Of those previous four I performed well at three of them. Only the Labor Day race was a little bit of a disappointment because I couldn’t get my legs to turn over. I raced the week after IMCHOO and put in a strong effort. The week after I paced someone at the Hartford 1/2 Marathon. Then last weekend (10/18) I pushed my son in a stroller for a fun 5K where we placed second overall and first in my age group. We had a time of 20:57. That took a lot of out me but I recovered in time for the marathon. The night before the race I drove up and stayed in Exeter, NH. It was a beautiful hotel. I had dinner there then caught up with a friend for a drink from my Ironman group. Sunday morning I woke up about 4 AM. I had my 2 bottles of Ensure, Oatmeal, and a cup of coffee. I drove to the race and got there about 6 AM. We were getting shuttled about a mile away from the race. Normally I consider this to be a pain but with a small race it wasn’t an issue at all. The good news is we were able to hang out inside before the race started. The temps were fine. I brought a ton of cloths so I was prepared for all conditions. I ended up wearing shorts, a long sleeve thin tech shirt, and my cycling jersey over it. I love wearing my cycling jersey because it has three pockets and it’s easy to carry GU’s in them. I also ran with my iPhone. The course was two loops and the race started at 7:30. We lined up at about 7:20 and a few of us made small talk with what our plans were and trying to work together. We were in the 7:25 (3:14/3:15) per minute mile pace group. We met our pacer who was only around for the first 1/2 and then another person would take over for the second half. This kind of annoys me. I get why they do this but I prefer to have one person run the whole thing. I wanted to run with a 7:15 (3:10) pace group but one didn’t exist. Once the race started we had a group of about 5-7 that was going to stay in the pace group. Our pacer had another girl with her learning how to pace. Within the first 1/4 mile I look at my watch and realize were averaging 6:45 for the first mile. I looked at the guy next to me, David (We chatted about working together), and said “this isn’t going to work”. We slowed down a bit to do a 7:14 minute mile for the first mile. I was okay with this pace but then the second mile we did 7:32 so we were averaging 7:23 overall. Over the next 5-6 miles I stayed in formation and just went with the pace. A few of us were studying the course so we knew what to expect the second lap. A few of us made an agreement to make our move at mile 16 because the course was fairly flat and wasn’t as rolling the first few miles. I spend a lot of time looking at my watch during the beginning of a race. I am mostly concerned about my heart rate. I never want to peg it especially on hills. I really felt pretty good overall. I could feel my upper legs were a bit sore and it could have been from pushing my son on the 5K. I am not sure though. I felt this around mile 5 but it wasn’t slowing me down. I remember it going away but wasn’t sure when. Around mile 8 I decided to go. I just wanted to go a little faster. I was hoping to bank some time and then if I slowed down I would be able to hold on. Miles 8- 18 went according to plan. At the 1/2 way point my time was 1:35:32 with an average of 7:17. At mile 18 I could feel my legs starting to tire out. I still ran a BQ mile (7:21) but they weren’t responding. Once I completed mile 19 I knew I wasn’t going to BQ. I thought I had enough in me to complete it in 3:20. At mile 23 I got passed by the 7:25 pacer. He asked me to come along. My legs weren’t going anywhere. :). The last 2 miles and change are on a dirt path. By mile 24 my legs were spent. My last two miles were slower at this marathon than they were at Ironman last month. I do think my nutrition wasn’t good enough for the last few miles. This would have made the difference to finish at about 3:20 but not enough to qualify. I tripped in the last mile and became light headed. I actually pulled a chest muscle as well. I thought I was going to pass out but was able to keep moving forward. It was almost surreal. Here I was pretty close to qualifying and right at that moment I thought I wasn’t going to finish. I will fix my nutrition for these last few miles for the next marathon. I talked to a few people including Todd. I have raced a ton over the last 10 weeks. I know my body needs some rest but I also know I need another 20 miler run in me before my next marathon in December. I have a race this weekend then I plan to get back to training before I go to Texas. I need to get back to basics. I want to put in a solid 3 1/2 weeks of training then look to peak again for Texas. Below is a break down of my mile splits…. Running a 1/2 marathon less than seven days after completing an Ironman seems a bit dumb or insane. Probably somewhere in between. This plan actually came to fruition in late April. While talking with a friend we were trying to come up with a plan for me to run a fall marathon. I knew running a marathon just a few weeks after IM Chattanooga, say for example, the Hartford Marathon wouldn’t give me enough of a rest and give me the opportunity to have a chance to Boston qualify. They were interested in running Smuttynose and it would make sense for me to run with them. They found a marathon at the end of October that is fairly local and would give me enough rest to have a chance to BQ. This race is the Loco marathon and is scheduled for the 26th. 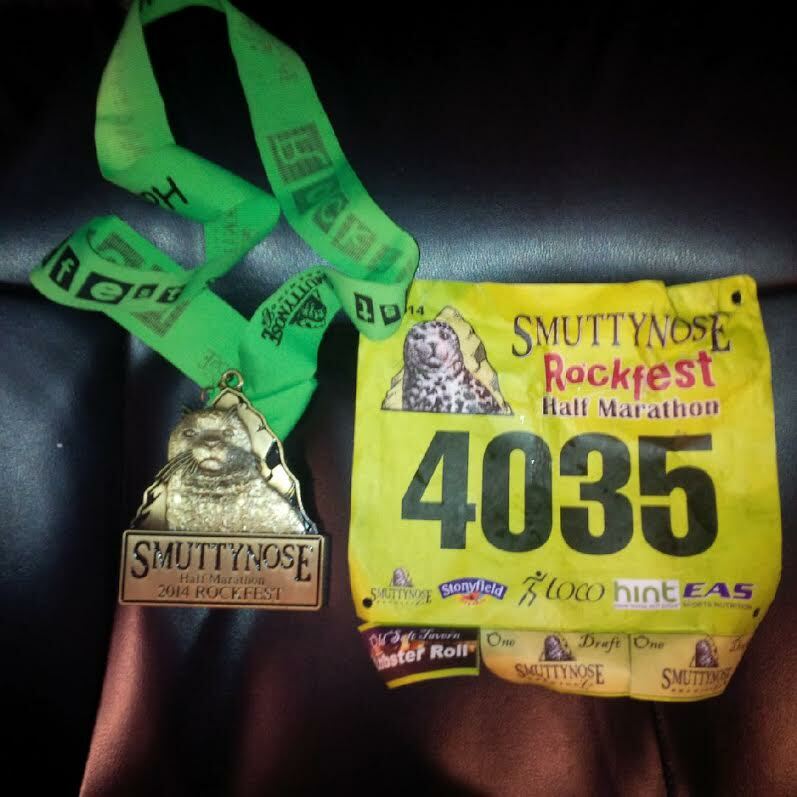 They weren’t able to run Smuttynose with me on October 5th but it gave me a chance to see what my fitness level was three weeks out from the Marathon. Last week following my IM on September 28th was basically full of as much rest as I could get. For the first 7-10 days after an IM I don’t really sleep or eat consistently. I didn’t get home from my flight on Monday night until about midnight, Tuesday I picked up a friend at the airport and wasn’t asleep until 1 AMish. On Thursday I did go for a five mile run but I was up late. However, I did sleep well. Then on Friday night I played Soccer and again didn’t sleep well. On Saturday my friends were throwing a party and even though I wasn’t out late I didn’t get to bed until about 11 PM for a 4:30 AM wake-up. On Sunday I woke up about 4:30. My body was sore from Soccer on Friday night. In fact my body hurt more on Sunday morning than it ever did during the week. I took a few nasty hits Friday night and my back was pretty sore, My calf was still very tight from Sunday’s race, and I wasn’t feeling 100%. I had my normal pre-race meal, 2 Ensure’s, Oatmeal, & Coffee. I also had a Powerbar about 60 minutes before the race. I met my friend Amanda and her friends to get my bib and t-shirt. With Smuttynose you have to now get your bib the day before. However, I learned that morning that they were letting people pick up their bibs. For people coming out of state and races this short you can’t require us to pick up our bibs the day before. I get it for the marathon, 70.3, and 140.6 distances. You can say doing this makes it less hectic on race day which is true, it’s really for the town to make extra money. You are asking us to get a hotel nearby. For distances less than a marathon I won’t sign-up for it if you require this in the future. I lined up for the race about 5 minutes before the start. I was stuck near the back with the 8:30 pace group. I was able to stretch a bit because I needed to run back to my car and put a bag in it. It was fairly chilly at the start so I wore a long sleeves winterish pull-over. I would later learn I was a bit overdressed but it wasn’t that bad. I carried one GU with me. My race strategy was to see how my body felt. I knew my quads were feeling about 85-90% but I wasn’t sure what would happen later on in the race. Mile one was very hectic. I couldn’t just go and pass a ton of people I needed to let the race happen. It does take a lot of energy to zig zag around. You can see from my numbers below that I ran the first mile at 8:42. For much of the first mile I was averaging close to about a 10 minute mile but it opened up around 8/10th’s of a mile. Mile two was still pretty busy but I was able to run much more freely. Miles 3-10 went by pretty fast. You are running the first seven miles along the shoreline. The course is flat overall. I think around mile 7-8 there was a respectable hill taking a turn off of the beach. You head into a neighborhood for miles 7.x to mile 10. It is shaded and families are out. Once you get back onto shoreline around mile 10 you had some headwinds but it felt overall flat. The last mile I noticed my heart rate a little higher than I wanted. I could tell I was getting tired. I ran with a guy from miles 10-12. We pushed each other and eventually he passed me in the last mile. My legs just weren’t strong enough to hold on. This was a great race and based on my time I am feeling pretty good about my marathon at the end of the month. But not sure if my legs will be able to hold on to a BQ pace for the whole distance. We will see…. IM CHOO official time: 12:17:17! How does one go from a 16:07 to 12:17 in 135 days? One word.. Nutrition. It’s all about the bleeping nutrition! Coming off of Texas in May I was pretty deflated from messing up my nutrition again. This happened in Louisville as well in August. I had trained hard through the winter. I did plenty of swimming, enough biking, and a ton of running. I took off most of June from training to give myself a mental break. I did a little bit of group exercises classes with Kate (Something I mentioned here… Why IMCHOO Will Be Different! ). I was also nursing a sore back from walking so much on the concrete. My training for the summer was fairly standard for IM events but I did a bit more running. I spent a good amount of time on the bike in July but by August I wasn’t riding as much. I did enough swimming to get by but not enough to feel like I was going to be strong in the water. What I did was run a lot. I was running about 5-6 days a week. I wanted to stick with my strength. I felt with my legs being in the best shape of my life it would help me on the bike and then give me enough to survive the run. 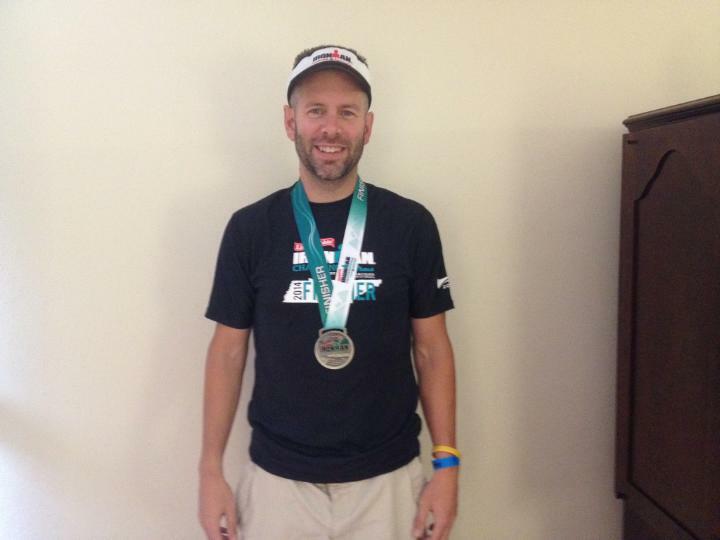 In August I did a 1/2 Ironman, Timberman, in New Hampshire. Riding up with my friend Aziz from my house to NH we talked about so many things. I really learned a ton from him. He put me on track to have a good race there and set me up for the fall races. I will describe this in more detail when I talk about nutrition. When I left home on Wednesday the 24th I weighed 168 pounds. The next few days leading up to the race I put on about 3-4 pounds. I probably weighed about 172 on race day and was a bit bloated. Which was okay. I only did one run the day before as well as a swim in the afternoon. I did test out my bike in a parking lot. I wanted to lube it up and make sure the bike computer was working. Also leading up to race day I talked to my friend Todd. He is very good at keeping things in perspective. He has been through this before several times and knows what needs to be done. In Chattanooga I did walk a lot more than I did when I was in Texas and Louisville. I think on Thursday through Saturday I walked at least 5 miles each day. My legs by Saturday were a bit tight and I should have brought an extra pair of sneakers and not wore my flip flops so much. This didn’t effect my race but I already have this on my list for Texas 2015. On Wednesday evening I got into my hotel about midnight. Got some sleep and woke up about 7 AM for work. I spent most of the day working and then went to check-in at Athletes Village at about noon. As I said on my Facebook status if you don’t get chills when you walk in there it’s time to hang it up. I went to lunch with some friends from my Ironman Singles group on Facebook. On Thursday afternoon I finished up work and then took the 1.5 mile walk to meet up with more Singles for dinner. I met a few people and I ended up hanging out with a guy named Greg B. for the rest of the weekend. As we were grabbing dinner we talked it up with a family. A 6 X Ironman named Brett, his wife V (2013 Louisville), and their son James, who was 20 and competing in his first Ironman. (Note: I saw him on the course 2-3 times and he finished strongly). While Greg and I were talking to the family Brett gave us some tips. He recommended Campbell’s soup. 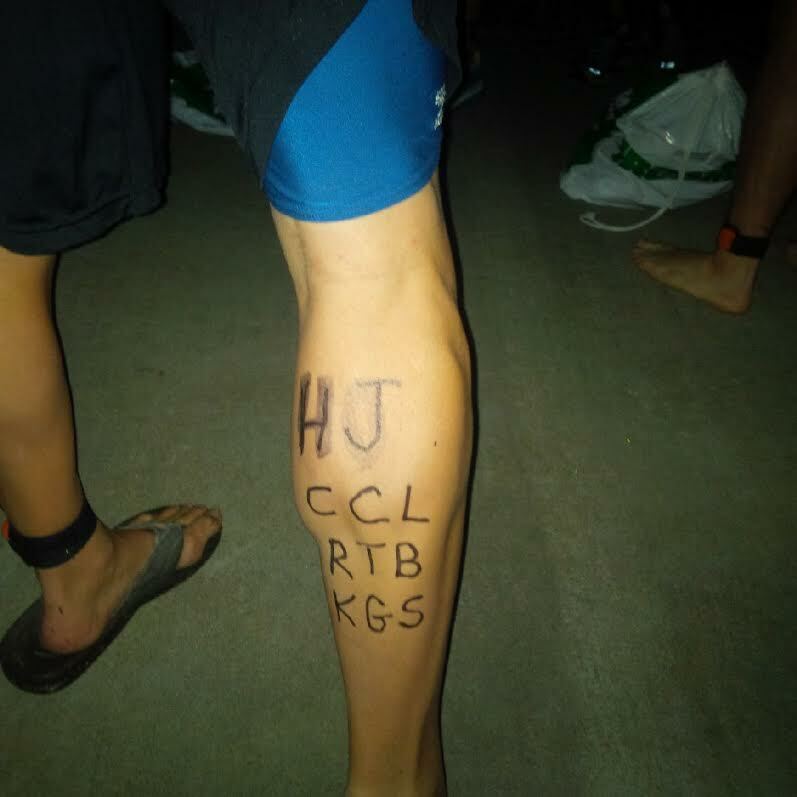 All Ironman competitors are always looking for tips. We know it’s hard work but what are they doing differently than I am doing? Most of us are just trying to improve and finish. We’re not racing against anyone. So when Brett told us about Campbell’s Chicken Noodle soup it made total sense. This is because of the high sodium and you’re getting actual food in you. He had a can in a few transition bags. Greg and I looked at each other and said we have to do that. On Friday I woke up and worked most of the day. I did head to an Endurance Nation talk with my friend Catherine and Greg. It lasted about 90 minutes and they talked about all different things. The biggest tip they gave was don’t do anything until Mile 18 of the run. Meaning just stay within yourself. Don’t put it in the water, bike or the first 17 miles of the run. I followed this pretty well. On Friday afternoon my parent’s flew in and I headed back to Athlete’s Village with them. they picked up their VIP passes and I showed them around a bit of where the bike/run transition would be. On Friday evening we had the welcome banquet dinner. About 15 of us from the Ironman Singles group sat together at a few tables. This was the first time I went. I think it’s mostly because I had friends to go with and wanted to get this experience. From now on I will go to the banquet. I met so many people. The ceremony was wonderful. They showed a video of the history of Ironman. They also showed inspirational videos of people who would be competing in the event. I also got my picture taken with Mike Reilly. Saturday morning was really a day of relaxing and doing a small bit of exercise. I believe in running the day before a race. I do 2 miles and then a one mile walk to reflect. I checked my bike in after my run and also did the practice swim. The talk was the swim would be fast because of the current. I swam 400 yards in just over 5 minutes. Normally I swim 500 yards in about 10 minutes. They said they would slow down the water but it would still be fast. I thought I would end up with about a 1:15 – 1:20 swim time but wasn’t making any assumptions. After the swim practice I caught up with Greg. I helped him check his bike in and we grabbed some food. After that I went to my room and relaxed for a bit. I had Chicken Parm for lunch and dinner on Saturday. It felt filling and was exactly what I was looking for. I was back in my room for the night about 6. I fell asleep about 10 or 10:30 PM. Just before I went to bed I did have one bottle of Ensure Plus. My alarm went off at 3:20 Am. I got out of bed at 3:30. My plan was to drink 3 bottles of Ensure plus (over 300 calories each), Oatmeal, & a protein shake. I drank 2 bottles, a small amount of Oatmeal, and the protein shake. Next time I need to eat the oatmeal sooner. I basically ran out of time. I showered and ate whatever food I could finish in time before I left. My parents came by at 4:40. We got to transition about 5. I filled up my tires, put on my water bottles, and gave them my special needs bags. We then got bussed to the start line 2.4 miles up river. I planned to have 2 bottles on my bike of Hammer Perpetuem. I had two more in my bike special needs that I would get at mile 51ish. I would have one bottle for the first hour. then another about 90 minutes in. In between that time I would have the on-course nutrition as well as about one bar/ GU per hour. I really think in the two previous Ironmen that I over did it then I went back the other way. It was a complete seesaw. So I paced myself on the food plan. With my morning nutrition much more solid than the previous two I would be getting out of the water still in the plus. I always put more than I need in my special needs bags. For the bike I had a ton of extra bars and a spare tube/ C02 cartridge. I also put in a Campbell’s soup to both the bike and run special needs bag. My run transition bag had a bottle of Ensure and Campbell’s soup. I drank/ate both of them. I had a few GU’s in there as well. In both my transition bags I had Hammer endurance tablets. I would take two every hour starting immediately after I got out of the water. I also had potato chips with salt as a way to just get some junk food in me. We ended up getting in line for the swim about 5:40. We weren’t going to be hitting the water until about 7:40. So we stayed in line for 2 hours. It went by really fast. My parents were there. We chatted with other athletes. I had about another 1/2 a power bar. I did talk to Rory about 20 minutes before I went in the water. We just chatted for a few minutes about what was about to happen. The age groupers started going in at 7:30. I ended up in the water about 7:38. I tend to be fairly relaxed before the start of a race like this. It’s a long day, a lot happens, and getting all worked up isn’t going to help me out. I do run through things in my head that need to happen. Meaning I think of food intake, I think of transition, and being very careful. Since this was a time trial start you’re only in the water surrounded by say 20 people. I knew I would be caught because I am a slower swimmer and wasn’t going to catch many swimmers. After about 5 minutes or so I like to look at my watch quick as I am swimming. I saw it was going to be a quick swim. I thought early on I would break 1:10. The buoy’s are numbered. The first half are Yellow and the last half are Orange. The day before the race I looked to see what the last number was. It was number 9. This really helps mentally because you can’t always see the end. Everyone talked about how hard the bike course was coming into this event. Several people posted on the IM Choo facebook page that it was a hilly course. I kept hearing rolling hills. If you live in New England, specifically in northeastern CT, where I have ridden well over 10,000 miles, we have rolling hills. Overall the course did have some hills but even the ‘hardest’ one wasn’t anything that tough. Any ‘A’ rider (I am a B to a B+) would never need to be in the little ring. I felt the course was very fair for an Ironman. The course was 4 miles longer because they couldn’t find a way to reduce it to the standard 112 miles. With the swim so much down river it made this fair overall. My Garmin 910X triathlon watch wasn’t picking up a GPS signal so after about 10 minutes I turned it off and back on again to just set it to the bike setting. I have a Garmin 500 on my bike and I prefer that for the bike rider anyway. That worked this time right off the bat. In my two previous Ironam I rode to my heart rate. I always kept it under 140 BPM. For this race I didn’t care about my heart rate. I decided I was going to push it as much as I could. I was only concerned about my food and liquid intake. I saw a ton of flat tires out on the course. I never felt the roads were in that bad of condition compared to other rides that I have done. Where I saw most of the flat tires was on Hog Jowl road. I later learned it was because people threw down tacks. I didn’t see any out there and I was near the ‘front’. I say this because I got into the water early and in bike transition I had to be one of the first 500 or so people on the bike course. At the bike special needs station around mile 51ish I got off and used the bathroom quick. I reloaded my two Hammer bottles and had a bottle of Campbell’s soup. This soup really perked me up. I saw my parents. I threw them my extra tube/ CO2. Special needs bags aren’t returned. For these types of events (70.3 & 140.6) I always carry two tubes on my bike. I wanted to make sure I had the proper nutrition in me. So instead of running right away I finished almost all of the soup. This is truly vital. I also took two more tablets before I started. I started running about two minutes into the mile. I also think I was able to get rid of the lactic acid in my legs because they felt strong right away. For the first 6 miles I was averaging sub 10 minute miles. I wasn’t pushing it and my heart rate was very low. When doing just a marathon people talk about hitting the wall at around mile 18-20ish. At Ironman this can happen at anytime. For me I hit the wall at about mile 7ish. For my other two Ironmen I hit the wall around the same place. This time I fought through it. I came up an aid station and asked for Salt. A guy from Base Performance gave me his product. It’s literately salt in a capsule. This guy saved my race. He gave me advice and I listened. I wanted to gag at first but it worked. Miles 8 and 9 were a bit slow for me as I was trying to recover. I saw my parents around here and they saw I was struggling. I gave them my visor and sunglasses. My head was swollen and the visor didn’t fit without it hurting my head. I only walked most of mile 9. This was a nasty hill and I was recovering. It was also raining at this point. For those that haven’t done a marathon at Ironman it’s VERY different than a standard individual marathon. At Ironman it’s usually a two loop course (Texas is three). We have water stops at EVERY mile. In a standard marathon you either have them after every two or three miles. At Ironman you have water, Perform (electrolyte), Sponges, Ice, Food (grapes, chips, oranges, & Pretzels), & Broth. Broth is for the second loop I believe but this is at EVERY MILE. As a novice you are taught to WALK through EVERY water stop. So what ever mile I was averaging you can subtract 30-60 seconds per mile. For me at each stop I get two new sponges and put them on my shoulders under my shirt. I have them dump a cup of ice down the back of my jersey. This helps to keep me cool. I also have a few oranges and a little perform. I was still taking my Hammer tablets every hour. I was also taking in salt just about every water stop. By mile 10 I was recovered and really felt myself getting stronger. My legs were never an issue all day. They were strong. It was making sure I had enough food in me. At the 1/2 way point, the second loop. I got my special needs bag. I walked for the next two minutes. I drank another bottle of Ensure and decided to carry my Campbell’s soup. The plan was to drink this at about mile 18-2o if my felt sick again. After mile 15 I only ran 3 miles at a pace of over 10 minutes. Every other mile was a sub 10. If I didn’t walk through the water stops all of my miles after 15 would have been under 10 minutes. I caught up with my friend Greg and we ran together for about 2 miles. It would have been nice to run together the whole rest of the race because he and I did 9:30 and 9:55 together. I really felt in ‘The Zone’ after mile 15. My plan was working. Running is my strongest discipline and I wanted to prove it. I DID!!! On mile 24 you have this 2-3 tier climb. Since I had run it a few hours earlier I knew what I had to do. I wasn’t going to walk it. I was going to shorten my stride and attack. While climbing it I heard a song on from Survivor that was blaring in their front yard. I am pretty sure it’s Burning Heart. It’s fitting because I trained a lot on the treadmill listening to that album. Once I got over the nasty hills of mile 24 I could feel it. I was hitting a down hill and wasn’t going to slow down. At mile 25 we cross this wooden bridge, Elvis gave a high five, and I was getting pretty excited. The fans were out. As I was coming into the shoot I took out my Camp Calumet banner and was holding it. I remember turning around, jumping up and down, and celebrating. Enjoying the moment. 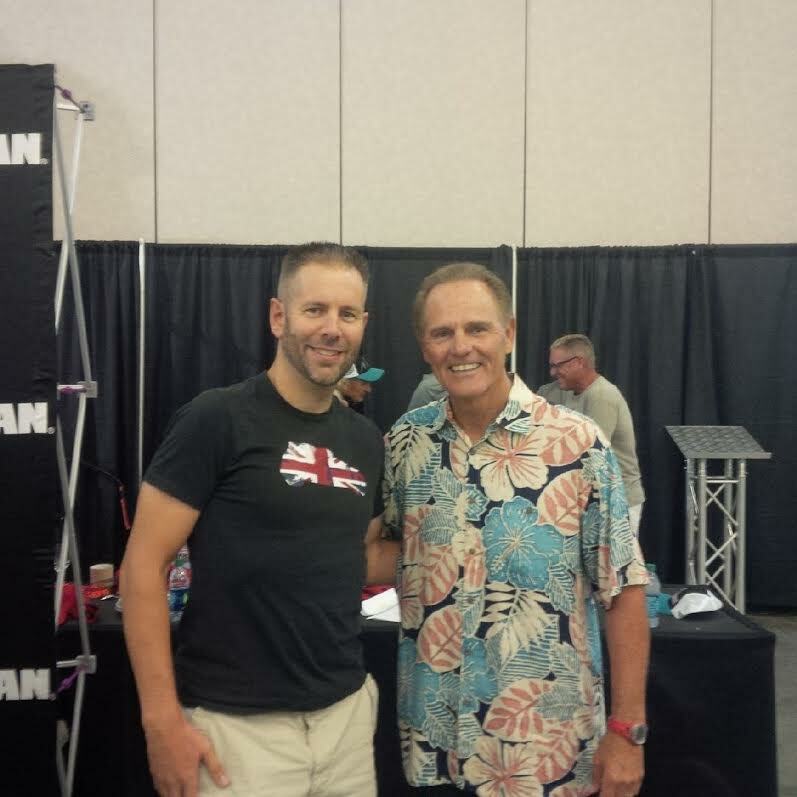 Then Mike Reilly said… “William Smith, You Are an Ironman!” No better words to hear in this sport! 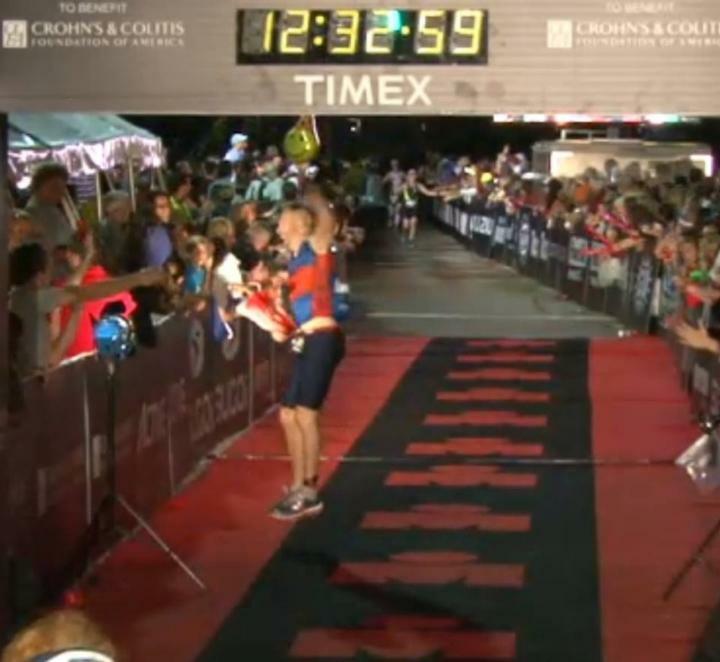 He also said.. “You’re one very happy Ironman!” Run: 4:36:41 10:33 average per mile. I ran a negative split marathon at Ironman. What that means is my last 13.1 miles was faster than my first 13.1 miles. 2:24 for the first half and a 2:12 for the second half. This run was the HARDEST marathon I have ever run. And not just because it’s a marathon at Ironman. The elevation for this course was tougher than any course I have been on. Final Official Time : 12:17:17!!!!!!!!!!!!!!!!!! I finished in the 50th% in my age group. The toughest age in Ironman. Overall I was in 1,005th place out of about 2,400 finishers. As my friend Kate said “That’s how you compete!!! !” The monkey is off my back. I went to medical immediately to get my calves iced. They wrapped them and as I was about to leave I got sick and threw up. They carried me into the medical tent to get me an IV. This was the best decision I made. They gave me one bag and I felt great afterward. Some people wonder how can I fall apart so quickly. Part of this is mental. I was out there for over 12 hours trying to stay focused and taking care of myself. Here I was about 15 minutes after finished without having anymore food in me. This was longest I went without food since bike. My body was just done. My mother got me a milkshake and I got back to my room about one hour after finishing. I showered and turned on my phone at about 10 PM. I was in just complete shock with all the messages I received. Thank you to everyone for following me. It means the world. Like I said in my dedication I may be doing Ironman but so many of you got me here. I especially want to thank Evan and my parents for keeping all of you updated. This was my third Ironman in 13 months. My biking legs were the weakest of all three even though I did better by a lot than the other two. However, my running legs were the strongest they have ever been. I think for the most part triathlon bikes are overrated until you get to a certain point or if it’s a very flat course. IM Choo is not a flat course and you aren’t on the aero bars that much. I understand you are more forward on the bike and that it may save your legs but if you aren’t in the aero bars you aren’t saving much time. Just my two cents. I think a road bike with aero bars makes the most sense on a course like this because it’s a much more stable bike. I saw 90-95% tri-bikes. Salt is a must at these long distance races. I didn’t have enough in Louisville and Texas. I won’t make that mistake again. I need to either wear a hat on the run course or need a visor that is adjustable. My IM Texas visor was so tight on me I couldn’t wear it. It’s honestly hard to think when you’re out there. You’re so tired and you really have to program your brain. Stuff starts to happen at around mile 80. The brain really stops working. I spend a lot of my time repeating things in my head so I can remember it easier. What goes through my head during the day? For me it’s just breaking down the distance as much as I could. It focusing on the task at hand and the next few miles. Buy Salt from Base Performance. Bring an extra pair of sneakers for walking around. Bring extra t-shirts. I only like to wear them a few hours at a time leading up to race day. I need either a hat or an adjustable visor. Walk coming out of the run to get in some last minute food. Don’t shave upper part of legs day before the race. Needs to be about 3-4 days out. Just where bathing suit is. Carry another soup for the first part of the run. I want to have two in the T2 bag. Then another soup in my run special needs bag. Have one at mile one, seven, thirteen, and mile 18-20ish. I know finishing an Ironman with hitting my nutrition doesn’t make me an expert and I know it can easily happen again to me. I know I still have a lot of goals and my nutrition still needs improvement. For me to break twelve hours I need a few more long bike rides of over 80 miles. I am not doing enough of them. I think this year I hesitated because of having breathing issues which we have learned is the lack of nutrition. I spent most of my time biking under 60 miles and only a few rides above it. I know I can break four hours for a marathon at Ironman. Part of the plan may be to only walk every other water stop. For those water stops where I am running through I will be sure to still grab some Perform and Ice but at a much quicker pace. Where do I go from here? What are my ‘new’ goals? When I started out training for Ironman in 2012 my goal was to break 12 hours. I now can see that in site without much of a difference in my training. My new goal is to someday break 11 hours. I want to get my bike down to a sub 5:30 and break 4:00 on the marathon. For the marathon, part of it is having the guts to run a bit faster. I don’t quite trust my nutrition yet but as I do more of these events It will become more natural. I still think I am a few Ironmen away from breaking 12 but with the right training I know sub 11 will be possible. Thanks for reading. If you have any questions let me know..
For me Ironman is about the journey. It’s where I have been and where I am going. To me it’s my progression in life. I know I wear Ironman on my sleeve (My calf really 🙂 ) like I once wore the Dallas Cowboys. But Ironman is different. It tests you mentally more than most people can imagine. Sure it takes a lot of physical ability but anyone who has done this distance knows after about 80 miles on the bike it’s about your nutrition leading up to this point and your ability to either embrace the pain that’s about to start or completely block it out. Ironman is about giving it your all. It’s living that lifestyle both personally and professionally. This something I am working on to do professionally that I hope will help me to excel in the years to come. Ironman is also about doing this for other people. It’s not about me even though I am competing in this event. It’s about dedicating it to individuals and groups who I believe have helped me to get to this point in my life. 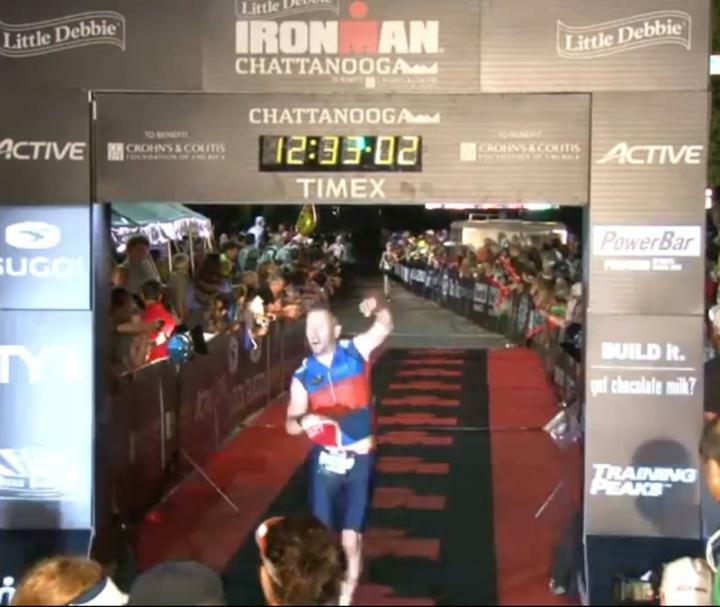 Ironman Chattanooga is dedicated to my son Hunter, RTB 2014, CCL, & Sarah D.
My son Hunter who is such a joy to be around. I love with all my heart. I have a ton of fun with him. As he gets older it’s so cute having real conversations with him. This summer he had the chance to help me a bit with my renovations with my house and loves seeing how it progresses. My goal in life is to be a role model to him and show him how much his mother and I love him. RTB 2014: Running with these group of amazing people is such an inspiration. If it wasn’t for people like Knute, Pete, Vicki, Karl, Jim, team captains, Calumet staff, & several others help to make this happen. Most of us were on staff together at Calumet at some point in the past. We have a common bond to give back. We have raised well over $50,000 to send kids to camp. While out there competing on Sunday the 28th I ask you to think of these kids and consider giving to Calumet or my RTB page. CCL (Camp Calumet Lutheran): If it wasn’t for Calumet I wouldn’t be where I am at today. This place taught me so much about life and the people involved in it. I have met so many amazing people. I have friendship’s that have lasted almost 25 years. I have been fortunate enough to meet several role models along the way. Especially people like Evan, Chuck, Todd, & Rory. There are really so many more people that I have looked up to and I want to thank you for it. Sarah: What you, Leisl, and the millions of others who are fighting cancer are truly the strong one’s. You inspire all of us to not only think of what you are fighting for but to push that much harder on race day. I know I will because of you. The Converse sneaker that is attached to my bike represents you and everyone else fighting cancer. The sneaker won’t be with me for the run this time because I have a different surprise at the finish. Why IMCHOO Will Be Different! I’m less than a week away from Ironman Chattanooga. My bike is in transit via Tribike Transport. I am getting excited to be participating in my 3rd Ironman and my 2nd one this year. My last one was Ironman Texas on May 17th. I learned a ton from doing Texas. I was lucky and I mean lucky enough to finish it. I threw up at mile 70 on the bike, was in the medical tent at mile 80 for about 20 minutes and just made the bike cut-off by about 15-20 minutes. Ironically my best 5 mile bike split happened at mile 90. The run wasn’t much better. I got sick at least 2-3 times and almost passed out a few times to the point medical people were holding me up at around mile 10 of the marathon. But I made it. As of Sunday evening my body is still recovering from last weekend’s Reach The Beach. I did have a decent training week but my legs are still pretty tired. This week I need rest with a few days of lifting and an easy run on Tuesday or Wednesday. 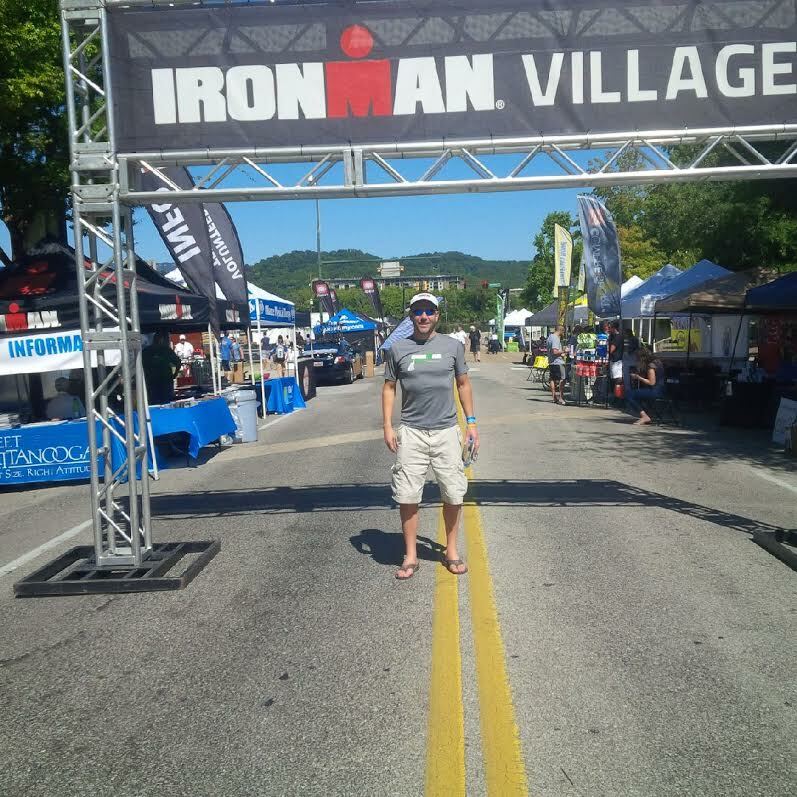 So why will Ironman Chattanooga be different? 1. My Core will be stronger. Coming off of Ironman Texas I took off most of June. I did a few runs, bike rides, and for the first time I took some exercise classes. Coming off of Texas I made the excuse of being sore and not doing well in these classes. Yes my back was full of knots but the truth was I have a very weak core. I have spent the last 6-7 weeks working on strengthening my core. It’s not as strong as it will be for next year’s races but I have made great progress since August. 2. Bike. I am getting back to basics on my bike. For Ironman Louisville I had my triathlon bike but I never got comfortable on it. For IMTX I used my road bike but had bars and a bottle on the front. For IMCHOO I just using my road bike. No frills (well maybe one surprise). I used this same setup at Timberman 70.3 in August and I felt very strong. 3. Legs. For IMTX I ran a fair amount including helping my friend Kate train for Boston. We did a few races together and that helped a lot. But as a runner I always peak in the fall. Last weekend at Reach The Beach I tested my legs and put myself on the limit (hence why I am sore) for about 14 of those 20 miles. I know with my recovery this week my legs for next Sunday will be just as strong as they were last weekend. Of course I won’t run near as fast as RTB but I know my legs will hold up. 4. Nutrition. Nutrition is really the forth sport. For IMLOU and IMTX I wasn’t able to figure it out. I learned something from my friend Aziz at Timberman. My morning nutrition hasn’t been enough. I will be taking 3-4 bottles of Ensure which will give me calorie intake of over 1,000. I will also have Oatmeal. My on course nutrition needs a ton of work as well. One of the mistakes I have made in the past was drinking three bottles the first hour on the bike. I really believe my body couldn’t digest it enough. I will be cutting this back to two bottles. I also learned from Todd and talking with Kate’s friends at the gym that I need to take a type of Hammer product. I plan to use Perpetuem. I took this at Timberman (one bottle an hour) and it really helped out. I will also be taking salt tablets. For emergencies I plan to take have a few bottles of Ensure in my special needs bag. I worry about the second half of the run and need my energy. I also plan to have some potato chips for some extra salt when it’s needed. 5. Focus. IMTX taught me how to suffer like I never did before. I take pride in being able to embrace suffering for events such as this. Part of this is being able to stay focused. I think in Texas I lost some of my focus. For a period of time I almost quit. But I didn’t!! For IMCHOO I will be a bit more focused. I think a lot of this is because of my nutrition and the confidence I have. 6. Chip on my shoulder! I have a bit of a chip on my shoulder coming into this race. Even though I have finished IMLOU and IMTX I am not satisfied. I have yet to have my ‘A’ race at Ironman. I don’t believe I will be satisfied after IMCHOO either but I want to be able to run the whole marathon. The marathon is my strongest event and I want to prove it on Sunday. 7. Anything Is Possible! It’s the slogan Ironman uses and I believe it. I have 100% confidence in my ability to complete this event again. It doesn’t matter that we are starting later, the bike is longer, and I don’t know the course. I know what it takes because…. I am a 2X Ironman!!!! !